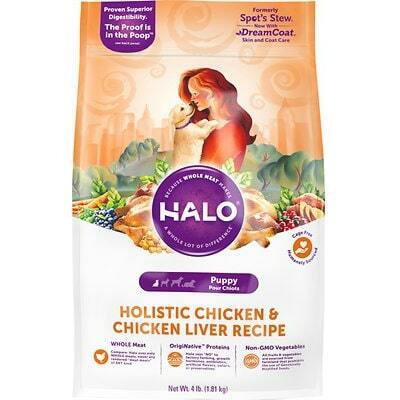 Halo Holistic Chicken & Chicken Liver Adult is an overall great quality dry dog food at a mid-priced. This product has 0 controversial ingredients, which also means no artificial preservatives, colors or flavors. The food has a high amount of carbs, compared to its protein and fat but and excellent meat and fat quality. Halo also has a below-average number of recalls. Additionally, the company was very transparent when answering our questions. Watchdog Labs recommends this product. Halo has not included any controversial ingredients in this food. Halo clearly names the meat and protein sources like chicken, chicken liver, and dried egg product. This is great because it shows you the species the ingredient comes from. They are just as clear with the two fat sources chicken fat and flaxseed - both identify the source they come from. This Halo product does not contain any controversial preservatives. It’s good to know that ‍not all artificial preservatives are bad. That’s because they serve an important purpose, which is to prevent food from spoiling. However, we consider 11 artificial preservatives controversial because of their potential link to cancer and other serious health conditions. 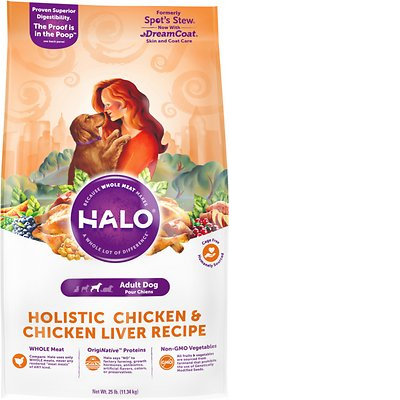 We did not find any dog food recalls for Halo products, that’s great! Our formulator for our meat-based diets has a Ph.D. in Nutritional Sciences from the University of Wisconsin and an MS in Biology from Wright University. He also has 30 years’ experience in Pet nutrition and nutritional research working for some of the major pet companies in America. For our Vegan products we work with Dr. Sarah Dodd who is a certified Veterinarian with a Masters in Pet Nutrition and is working on her Ph.D. in pet nutrition. Both her Masters and Ph.D. are focused on plant-based nutrition for dogs.